Militants from so-called Islamic State (IS) have been pushed out of the key eastern city of Derna, a rival Islamist group has said. IS "have all left Derna - they have no presence here anymore", Hafeth al-Dabaa, a spokesman for Derna Mujahideen Shura Council (DMSC), told the BBC. Derna has seen a three-way conflict between IS, DMSC and forces loyal to Libya's eastern government. The DMSC's claim has not been independently verified. Mr Dabaa said that five DMSC fighters and six civilians had been killed in fighting in Derna's Fatayiah area in the past 24 hours. Pictures on social media websites have been circulating since Wednesday, showing Derna residents celebrating in the port city. "Things are calm today (Thursday), and life feels normal, the only real problem is there is no cash in banks," one Derna resident told the BBC. "It was intense yesterday in Fatayiah with the DMSC battling IS, and there was also some bombardment by the air force in the city - today the DMSC can be seen manning checkpoints throughout the city." The resident was referring to overnight air strikes carried out by the forces loyal to the eastern government. Mr Dabaa said the city prison that held suspected IS militants had been bombed. The spokesman added that some of the inmates had managed to escape but most of them were later recaptured. Army spokesman Abdulkarim Sabra said the air strikes had targeted the DMSC in Derna's Sayeda Khadija neighbourhood and at Bishr prison, Reuters reports. IS established a base in Derna in October 2015 and fully controlled the city until June that year. Derna was a jihadist stronghold in the 1980s and 1990s during the insurgency against Col Gaddafi. The developments since Wednesday mark the fall of what is believed to have been the last IS foothold on the outskirts of Derna. 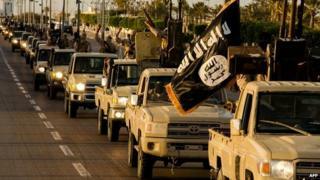 If this holds, it is a significant development and will be seen as evidence of the group's faltering presence in Libya. Despite the alarm bells ringing over IS expansion in the country in recent months, many observers believe the extremist group remains a minor player in Libya's bigger picture of armed groups. Today, IS fighters only have full control of the central city of Sirte and a stretch of territory on its outskirts. However, its members and affiliates pose a violent threat in other parts of the country. Libya's rival armed groups largely agree on the need to fight IS, but each side is fighting on, and for, its own turf - they have not been able to unite in the battlefield. In a separate development, the UN mission to Libya (UNSMIL) called on all warring parties in Libya's second largest city of Benghazi "to ensure that civilians are protected" as fighting continued. UNSMIL head Martin Kobler urged rival groups "to allow and facilitate the safe and immediate exit of all civilians who are trapped in areas affected by fighting and wish to leave". Much of Benghazi fell to the army and loyal militias in late February, but IS fighters and other Islamist groups still hold some areas.